Temperature-Resistant – From -196°C to 150°C. 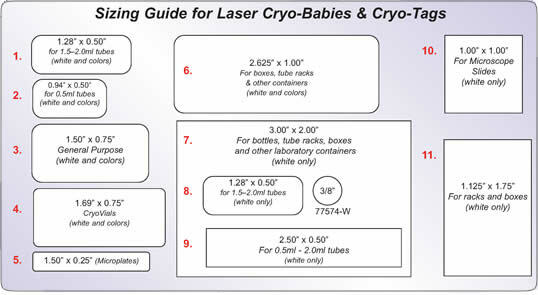 Cryo-Babies and Cryo-Tags withstand freezer temperatures down to -196°C (liquid and vapor phase nitrogen), boiling water baths (100°C), autoclaving and moderate oven temperatures (150°C). 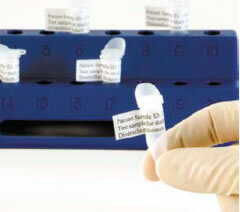 Tough – Chemically inert labels resist most organic solvents and caustic agents. They adhere to most plastics*, glass and metals without cracking, peeling or degrading. Innovative – Made with a flexible, polyolefin† label material and acrylic adhesive. This unique combination expands and contracts together with temperature fluctuations resulting in a strong adhesive bond. Packs are available in individual colors or in "Rainbow Packs"
100% Virgin Polypropylene tubes are recommended. Avoid the use of siliconized surfaces. 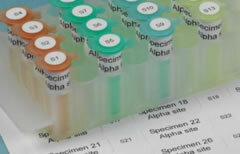 "The Choice is CLEAR" – Contents of vials beneath labels remain visible. Temperature-resistant – From -196°C to 70°C. 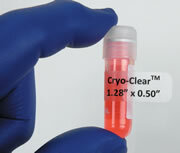 Cryo-Clear labels remain fully adhered down to -196°C (liquid and vapor phase nitrogen). 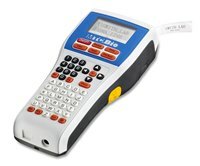 Durable – Chemically inert labels resist most organic solvents and caustic agents. Labels adhere to plastics*, glass and metals without cracking, peeling or degrading. 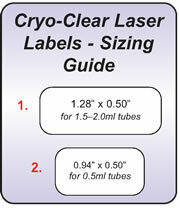 Laser Printable – Label sheets are specially top-coated to accept laser printing and other markings. Heat-resistant, stay-flat sheets will not jam in laser printers. Innovative – Made with a flexible, vinyl label material and permanent acrylic adhesive. This unique combination expands and contracts together as temperatures fluctuate resulting in a strong and sustained adhesive bond. * NOTE: Siliconized surfaces should be avoided. Apply to clean, dry tubes at room temperature. Tubes made of 100% virgin polypropylene are recommended. 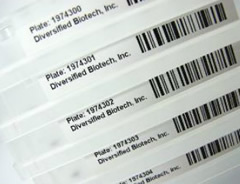 Barcoding – Print popular barcode formats for fast and easy sample identification. For permanently marking cloth, cardboard, and plastic. It will not fade at ultra-low temperatures. Smudge-proof. Package consists of three extra fine point pens in red, blue, and black, and one standard point pen in green. These 2-in-1 markers have dual tips: fine (0.7 mm) and extra-fine (0.3 mm) and are easy to handle for applications in bio-medical laboratories. Instructions: Discard protective inner cap. Twist end of barrel to advance. Point will not retract. Recap after use. These tapes mold tightly to any container, withstand acids, alkalis, oils, and greases. They will not crack, peel, or fall off in 500°F dry oven temperatures. Hi/Lo temperature tape also sticks tightly in dry ice, liquid gases, and in deep freeze conditions of cryogenic temperatures. Tape is available in widths of ½", ¾" and 1" on 250" roll. This tape must be cut with scissors. 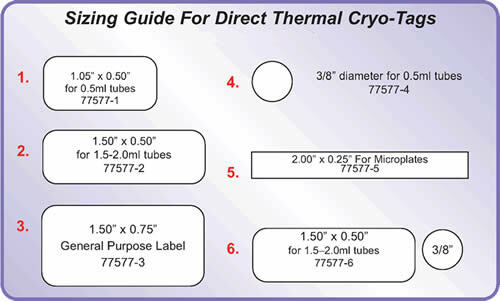 Direct thermal labels are white and on a 1" internal diameter core. 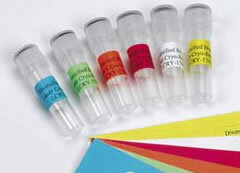 These labels are made from top quality materials, a wide range of sizes, designed specially for cryogenic use. These labels feature a smudge resistant surface. They are available in rolls for thermal transfer printing or in 8½" x 11" sheets for laser printing. All accept handwriten notations with cryo markers. 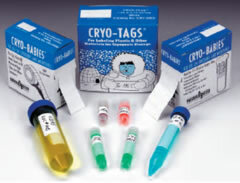 Ideal for use with cryotubes, these labels are best used with thermal transfer printers or cryo marker pens. Available in a wide range of sizes on sheets or rolls, they are not recommend for laser printing. Labels feature a synthetic surface that accepts crisp bar codes from thermal transfer printers or handwritten notations cryo markers. Supplied in sheets or rolls, these labels are not recommended for use with laser printers. 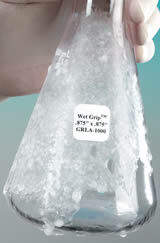 These textured labels withstand dry ice, deep freezers and liquid gases. Supplied in sheets or rolls. They are easily marked with cryo markers, not for use with automated printers. These unique labels are for sub-zero use, measures 15/16" x 2⅜". They feature a 15/16" x 15/16" area, frosted for thermal printing or marking with cryo markers. The remainder of the label is clear. It wraps around the cryo-tube to provide a protective cover for printed information while leaving a clear space for viewing the tube contents.